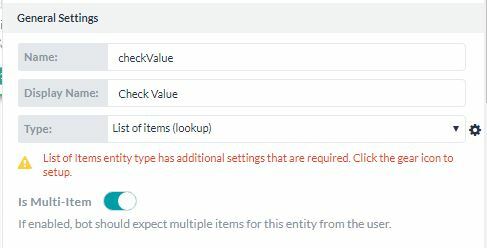 We are doing a testing of Entity Lookup data type for a requirement, with ‘Is Multi-Item’ set to True. When the user utterance contain multiple values(i.e. look up 1 2), then all values are not picked up. Instead in ‘Session Context & Variables’ tab under Entities it showing an array with a single element as shown in below snapshot. In the entity node of “List of items(lookup)” data-type, if the “is Multi-item” property is set to true, then the entity node expects multiple inputs in “comma-separated” format. Please give “lookup 2,1” as input. Hope the above explanation resolves your issue.